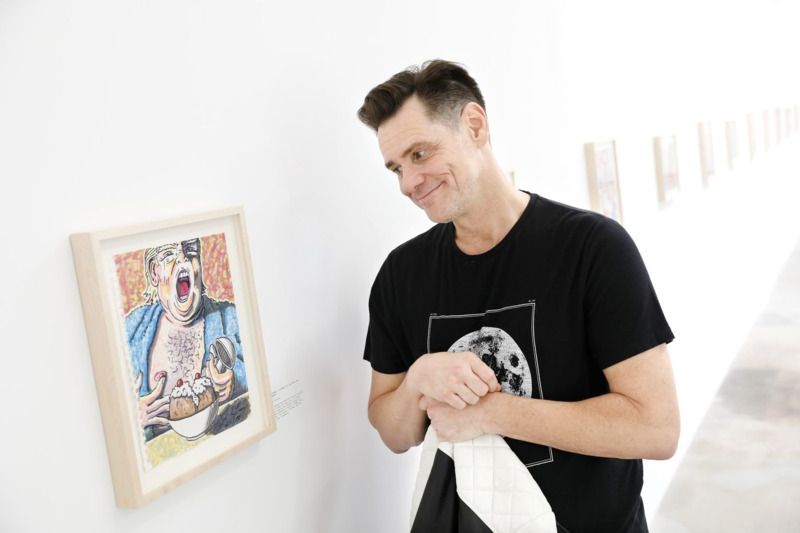 A few week ago Jim Carrey had a phone conversation with Francis Anderton the host of the DNA (design and architecture) show of the KCRW Radio channel. FA - For Carrey himself. He says getting feelings out is what drives him whether through a performance on stage or a line on paper. JC - To me a thought isn't complete until it turns into something creative. It's all sculpting to me it's the same thing I find you know because I know that people want to define things in their heads. They want to make sure that you can be defined in whatever. I've just never really been struck by that. I've never found you know that that it's a pigeonhole situation for me in the world because it's all been one thing always. It's always been taking base metals and turning them into something fairly beautiful that people can enjoy. Or people can be relieved by or people can be confronted by. JC - I hope I have no reason to draw another political cartoon. I hope I have no reason. I really do. JC - Probably about seven years old when my one of my uncles, which I have many cousins and uncles north of Toronto in a place called the Sudbury where my father was from his side of the family and there was a death in the family way up north and I got on a train with my mother and it was one of those just things that stick out as the most bonding moment we had together we had many bonds together but that moment was really one of those special things you never forget, you know, drawing pictures of creating characters out of nowhere called Melvin muffin mouse or whatever. I asked my mom to make up a name and I'd create the character. But it's all the same thing I'm doing that on the screen too and to me is that the lines are blurred now. I don't know whether it's going to be a painting or a character for a movie or whatever it is but it's all sculpting. FA - But you have done a fair amount of courage as a child to come up with those characters and then go and show them around to strangers on the train. JC - I was shameless. I was absolutely shameless and still shameless in that way. You know I get bitten sometimes but mostly I just want to show that I'm another flawed whacked out human being but that I can kind of have fun with the form you know that's what I've always tried to offer people is freedom you know freedom from whatever stucks ways they were thinking. FA - So fast forward to 2016 and in comes this administration and like like many you feel very frustrated with it. You have many vehicles for expression you have a large stage to perform on but you chose cartoons. JC - And I have to reconcile the fact that you know something so innocent for me when I was 7 and 8 years old a 8 to me and somewhere in there to 10 years old, something so innocent these cartoons have been repurposed for wartime. I'm in it because it's the part I'm playing just like Bob Hope entertains the troops. You know I chose this. And you can do it in a way with animation and cartoons you can do it in a way that reaches through prejudice I believe it hits another part of the brain somehow the receptive part of the brain and it's that's part of the motivation but it really has done me. I haven't done it. FA - In terms of it doing you that other than you doing it. What we out there understand about Jim Carrey as an actor. 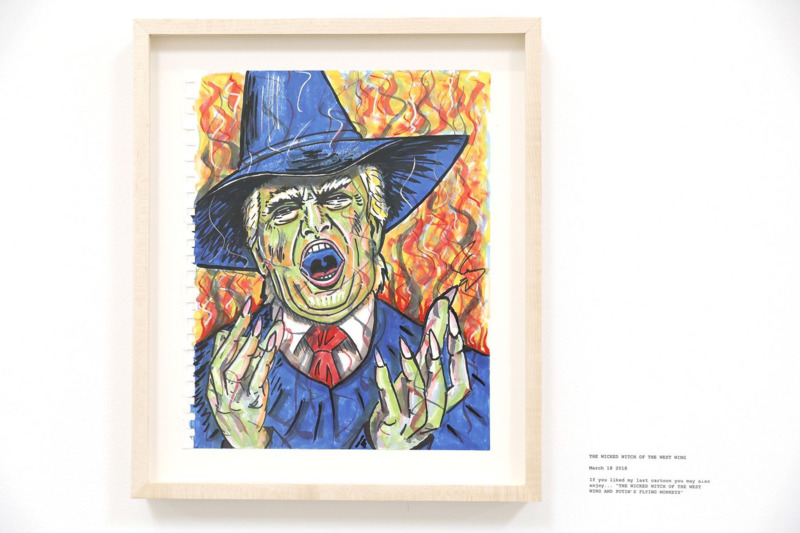 You know we've sort of already over the years about the way in which you completely inhabit a character when you perform that cat and you all that character offstage and I'm just wondering when you take a drawing Trump or Putin or a Giuliani. Do you have to sort of become those people in order to express them enjoying a little bit. JC - Yeah a little bit. I have to live through them for sure. FA - So you're entering that space so what's it like in Trump's head. JC - It's a gigantic child needing a hug. But also I mean I think at this point he's as bamboozled about himself as 40 percent of this country is, honestly. He's tricked himself into thinking is a superpower of some sort. And honestly I just think that we lost track of what a hero is in this country. Many people did anyway. I think reality shows were, you know, a morbid fascination that became a dangerous thing.